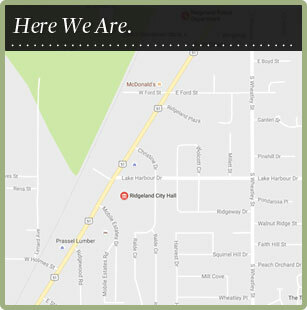 The City’s motto “Living Right in Ridgeland” includes living safely. The most well known jobs of a fire department are fire suppression, rescue, and emergency medical care. However, we strongly feel that providing fire and life safety information to the public before an emergency occurs is an equally important job. The United States is the worst industrialized nation in the world in terms of fire loss (injuries, deaths, and property loss). In this country, Mississippi annually ranks #1 (and less often #2) in fire deaths per capita. Unfortunately, our state ranks near the top in terms of unintentional (and preventable) injuries from other causes also. Besides fire and burn injuries, areas of concern are motor vehicle injuries, poisoning injuries, fall injuries, firearms injuries, bike and pedestrian injuries, water injuries, choking, suffocation, and strangulation injuries, and injuries caused by severe weather. Risk groups from highest to lowest are children, then senior adults, and finally the rest of the population. Are preventable injuries really a problem in this country? The answer is absolutely YES. For children in the United States, preventable injuries are worse than a problem—they are an epidemic! Unintentional injuries are the leading cause of death for children ages 1 to 14 (nearly 6,700 deaths per year). More than 120,000 children become permanently disabled every year due to unintentional injuries. One of every four children (approximately 14 million) is injured seriously enough to require medical attention. For every child who dies from a preventable injury, 45 others are hospitalized, 1,300 are treated in emergency rooms, and nearly 1,600 visit a doctor’s office. Why are so many preventable fires and injuries occurring in the U.S. and especially in Mississippi? Primarily for two reasons: lack of knowledge and lack of action. You must make the effort to acquire more safety knowledge and take safety actions in your home, at work, and wherever you are. Fire and life safety programs for ages 3 to 103 – for schools, home-school groups, businesses, health care facilities, hotels/motels, apartment communities, homeowners associations, retirement communities, churches, social and service clubs, scouts, etc. We can go to you, or you can come to one of our fire stations for a fire and life safety program and station tour. Annual programs include Fire Academy for Kids and Fire Prevention Week program at Northpark Mall. Fire Academy for Kids is held every summer; call for schedule information. Fire Prevention Week program is held every October. Other programs are available upon request. Literature for over twenty fire and life safety subject areas are available at our fire stations, City Hall, and the Ridgeland Public Library. Fire safety videos are available for loan from the Ridgeland Public Library. Fire extinguisher training for citizen groups and businesses at your location or at a fire station. Fire and life safety inspections for residences. Fire and life safety displays and activities for community events. Consult service for businesses and citizens, to assist in developing fire emergency plans and severe weather safety plans. Fire Academy for Kids is a fun, educational, action-oriented program with two goals: to give children more life safety skills in fire safety, first aid, and injury prevention; and to introduce them up close and personal to firefighters, the equipment they use, and the jobs they perform. The prior will lead to increased life safety behaviors, by preparing the children to be able to prevent a fire or injury, and by preparing them to be able to react correctly should a fire or medical emergency occur. The latter will give them a better appreciation of firefighters and their often dangerous job, and it will provide information to those who may be thinking about a future career in the fire/rescue service. Children will participate in classroom learning activities and will perform hands-on training in fire safety, first aid, and firefighter skills such as rescuing a “victim” from a simulated “smoke-filled” room while wearing an air mask, using fire hoses (and getting wet! ), using extrication tools (Jaws of Life) on a crushed car, etc. Homework assignments will be given and are intended to involve the whole family. (After all, life-safety knowledge and skills are important for everyone.) A parent’s signature will be required on each completed assignment for their child to be eligible to receive an awesome homework reward each day. Station on Friday of each week at 11:00 a.m. Parents and guardians are invited to attend and share in their child’s accomplishment. For more information, contact Nathan Bell at Central Fire Station. Smoke is the biggest killer in a fire, followed by heat and flames. But time is your worst enemy. In as little as two minutes (less time than a television commercial), a fire that just started could be filling your home with smoke and heat, and a whole room could be engulfed in flames! Having the safety knowledge and taking safety actions in your home before the fire could help buy the time you need to escape and survive a fire. About 80% of all fire deaths occur in the home. The knowledge and suggested safety actions provided below can help keep you and your family out of this statistic! Smoke detectors provide early warning in the event of a fire. Installing and maintaining them can double your chance of escaping a fire. Install detectors on each floor, including the basement. Install them outside of sleeping areas. Install them in bedrooms, living room, laundry room, etc. The more you have, the faster you will be alerted. Interconnected units are better, but cost more to install, as do monitored alarm systems. To prevent false alarms from shower steam and cooking, don’t install detectors too close to bathrooms or the kitchen. Units near these areas should have a silence button so any false alarms can be easily cancelled. If you have A/C detectors, make sure they have battery back-ups to keep them working during power failures. Test detectors monthly. Use a broomstick to reach the test button – to prevent a fall from a chair or ladder. Vacuum detectors regularly to prevent false alarms from dust accumulation, and so they remain clean enough to allow smoke to enter. Change batteries immediately when you hear the low-battery warning chirp. Replace detectors every 10 years. Install extinguishers on each floor and also place them in vehicles. Regularly review the use and maintenance instructions on extinguishers. Call the fire department to schedule a fire extinguisher training class. Portable fire escape ladders are available for two- and three- story homes. Place one in each upstairs room that has a window. Demonstrate to children how to place them in a window. Purchase a whistle on a lanyard (a cord worn around the neck). You can find these in a sports department or store. Add a lightweight flashlight to the lanyard. Add a house key to the lanyard. Place this combination in each bedroom next to the bed. In the event of a fire, tornado, or other emergency, place the lanyard around your neck. The whistle can be used to alert family about an emergency. If someone becomes trapped, it can be used to signal their location to firefighters. The flashlight can be used to see in the dark or under smoke, and it can be used to signal firefighters from a window if someone is trapped. The key will be needed to unlock a double-keyed door from inside. In the event people escape from windows leaving doors locked, it can be given to firefighters outside so they can quickly enter the house to save others. Fire sprinklers have been used extremely successfully in commercial buildings for well over 100 years. They are now available to be installed in homes. Fire sprinklers control (and often extinguish) fires before extreme smoke, heat, and flames take their toll on lives and property. They can be installed at relatively low cost, especially when compared to the cost of losing a loved one or losing your home and possessions. It has been estimated that nearly 85% of home fire deaths could be prevented by combining the use of fire sprinklers with smoke detectors. When you consider that fire sprinklers save lives, property and money, how can you afford not to install them in your home? Draw a floor plan of your home showing all rooms, doors, and windows. Draw arrows to show two quick ways from each room to the outside. If one way out is a window, make sure it opens easily and show children how to open it and remove the screen. If you have security bars that don’t open, remove them or change them to bars with quick-release latches. Pick a safe family meeting place outside in front of your home (a tree, the mailbox on a post, the neighbor’s driveway, etc.) and show it on the plan. Show the 9-1-1 emergency reporting phone number on your plan. Hang the plan where it can be easily seen (on the refrigerator, for example), and review it with everyone, including visiting relatives or friends. Practice your home escape plan several times a year by having exit drills. Have everyone meet outside at the safe family meeting place. Practice some drills at night with the lights off, so everyone will learn how to quickly escape with low visibility. Practice escaping from different rooms and using different exits. to get your belongings. Remember, time is your worst enemy in a fire. Get out fast. Never go back in a burning building. Your chances of escaping a second time are slim. Get Out and Stay Out! Pick up fire prevention literature at your local fire station, City Hall, or Ridgeland Public Library. Pamphlets are available on cooking safety, heating safety, electrical safety, flammable liquid safety, etc. Other literature available covers fire safety equipment, fire safety planning, severe weather planning, and other injury prevention topics. Schedule a fire and life safety program to be presented by the fire department. Encourage others to attend. Visit the websites listed below for more information on fire and life safety. The following websites contain useful information on these subjects: 1) fire safety, 2) burn prevention, 3) injury prevention, 4) home safety, 5) safety recalls on consumer products, 6) fire sprinklers, 7) college campus fire safety, 8) burn survivor advocacy, 9) trauma survivor advocacy, 10) response to terrorism, 11) natural and man-made disasters (including severe weather). Numbers after each website indicate subjects covered by that website. State of Mississippi – Click on “State Agencies” at bottom of page, then click on any agency listed below to get information on the subject numbers shown. Would you like to schedule a safety program, fire extinguisher training, or a home fire and life safety inspection? Would you like the fire department to participate in your event with a fire and life safety display and/or fire and life safety activities? Can we help with your fire and severe weather safety planning?